Comet Electronics was established in 1991. The main activity of the company is concentrated in the import, export and distribution of electronic components for industrial purposes. The commercial activity of the company covers Bulgaria and the Balkan region. The volume of annual turnover, the support of a great variety of items included in the Line card, the regular supplies from over than 50 world known manufacturers and distributors determine the leading role of Comet Electronics among the Bulgarian distributors of electronic components. 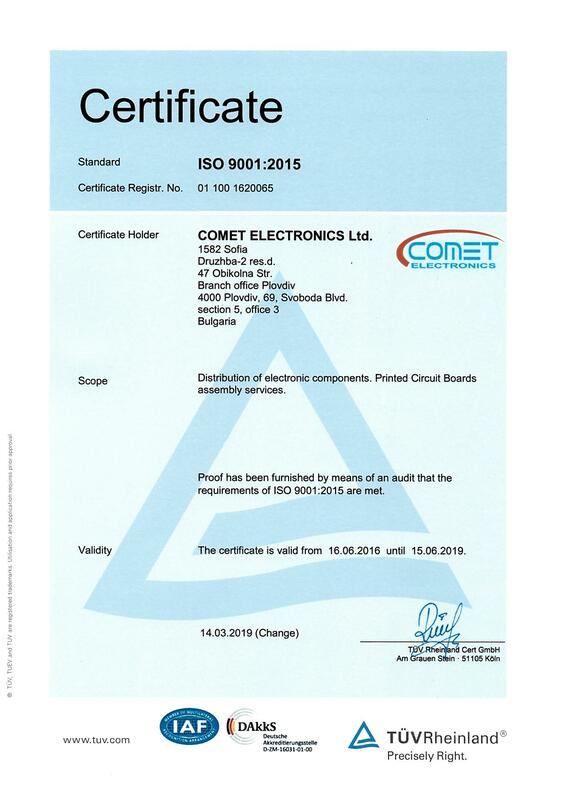 Comet Electronics serves more than 5000 middle and small scale manufacturing and trading companies. It is the main supplier of the basic industrial companies in Bulgaria. Mainly the distribution goes through our office in Sofia. We have also two retail stores for selling of small quantities - in the downtown of Sofia and in the commercial street of Plovdiv, the second biggest town in Bulgaria. The warehouses of Comet Electronics guarantee that we are able to provide our customers with everything at any time at the best price. We are able also to ensure the annual manufacturing programs of our customers. We perform also special supplies of items not included in our Line card for R&D, for manufacture of prototypes and pilot series.